Opening the mold for the secondary mirror of ESO's Extremely Large Telescope. Next, it will be ground down and polished into the largest convex mirror in the world, according to ESO officials. 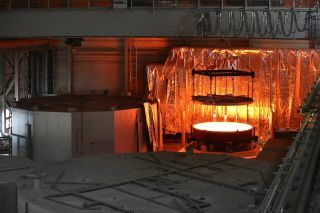 An enormous piece of glass-ceramic has been cast for the secondary mirror of the European Southern Observatory's (ESO) Extremely Large Telescope, entering a year-long cooldown and heat-treatment period until it's ready to be ground and polished for use with the megatelescope. The completed mirror will measure nearly 14 feet across (4.2 meters) and weigh 3.9 tons (3.5 metric tons) — larger than the primary mirror for many current research telescopes, ESO officials noted in a statement. For the Extremely Large Telescope, though, the mirror will be suspended upside down over the 128-foot (39 meter) primary mirror, which is made of 798 hexagonal mirror segments. The telescope is scheduled to reach first light in 2024 on a mountain in Chile's Atacama Desert. ESO documents the casting process in a new video. After the year of cooling, the mirror base will be transported from Germany to France, where it will be ground into a precise convex shape and then polished precisely to within 15 nanometers to meet the giant telescope's needs. According to the ESO, the piece will be the largest convex mirror ever produced and the largest secondary mirror to be used in a telescope. The mirror is made from a special ceramic-glass material manufactured by the glass company Schott, which is used in many astronomical telescopes. The compound has very little thermal expansion when exposed to different temperatures, to avoid distorted measurements; it can be polished very precisely; and is chemically resistant, the statement said. The base for the secondary mirror of ESO's Extremely Large Telescope is revealed as the mold opens in this photo from May 2017. Once complete, the telescope will survey the universe in optical and infrared light, letting scientists probe deep into the universe's past to see how galaxies have evolved and pinpoint planets around distant stars, searching for signs of biological activity. There are two other megatelescopes under construction on a similar time frame that could share the burden of discovery: The Giant Magellan Telescope, also slated for the Atacama Desert, with a maximum 80-foot (25 m) light-gathering surface, and the Thirty Meter Telescope in Hawaii, whose light-gathering surface would stretch to 98 feet (30 m).